You need to think of each function separate with this cable. two sdi video (one to production) one from production to camera for video timer or teleprompter and so on. This is a video line only it can not power anything (*normally). Also it has one power cable, most people would run 12-14vdc on this power cable to feed camera and monitor, most cameras (not all) take that voltage, you would then need adapters or connectors to match that cable to dc power in, on camera, and monitor, making sure its the right voltage and polarity. Then I would add the ampere of your loads camera and monitor (and maybe front monitor) and buy a 12 volt power supply to feed it from control room one per camera. Another way would be to run 120vac (wall plug) on this line to power adapters at camera, I do not think they recommend this as wire size is small, no AC ground, and it would need GFCI outlet feeding it, but I am going to talk to Clark wire and cable about it. As I really like the idea of having that at camera… but most likely the cable is not rated for that voltage and current and it will need to be a 12-14 VDC voltage. Just some ideas for you. This is what is happening in the old 26 pin cables, (and newer broadcast cameras also except they use fiber for video now) but not fiber for power. The exception to all this is a camplex system that multiplexes power and signals together on one cable, it a separate complete system, I do not think its up to HD-SDI but I have not check lately, that is what some remote trucks use to get by with one coax cable, (I do not recommend for a small studio, I am just pointing out the options). For Fixed Camera studio installation or cameras you do not move much, also if the blue/orange color of cable is not an issue. 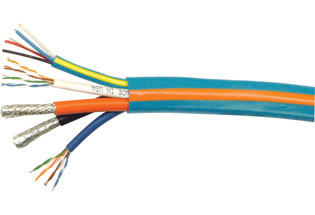 Within a single jacket, CRESCAT-DC-NP bundles (2) high-quality CAT5e cables and (2) RG6 quad shield coax cables along with a Cresnet control cable to facilitate fast and easy wiring for Crestron’s AV distribution switchers, room solution boxes, intercoms, and touchpanels. 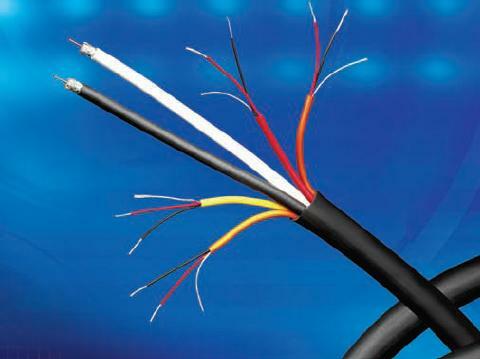 Inclusion of the RG6 cables allows for distribution of cable TV, DSS, baseband or modulated video, and other signals alongside the Crestron control and balanced AV signals.